This week has been an interesting one. I began increasing my hours as a hospice chaplain due to our growth. I began very part time almost 2 years ago. I never imagined that I would be so fulfilled in this very needed role. I have the best co-workers who understand the concept of a team and have the compassion to do the job. With the intensity of this week, I realized how much my coworkers and I need to slow down regularly to enjoy the simple things of life – family, friends, time with God, etc. 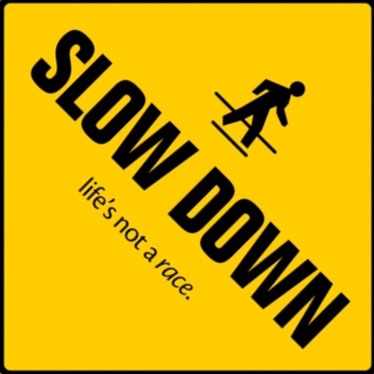 We all have fast-paced lives and need to slow down. So far, I have had breakfast with dear friends who were involved in one of my previous music ministries. I’m helping my mom find a new place to live. As I type, I am enjoying the cool breeze the Lord sent this way. I’m really looking forward to having lunch with my beautiful, loving wife. I am currently off on Friday, so these things are what I choose to enjoy today. Don’t go too fast that you can’t enjoy the things that really matter! If the Lord took a day of rest after creating the world (which He really didn’t need), we should follow His example and rest. There is so much peace and joy that come from resting in Him. Slow down this weekend and enjoy the goodness of the Lord!